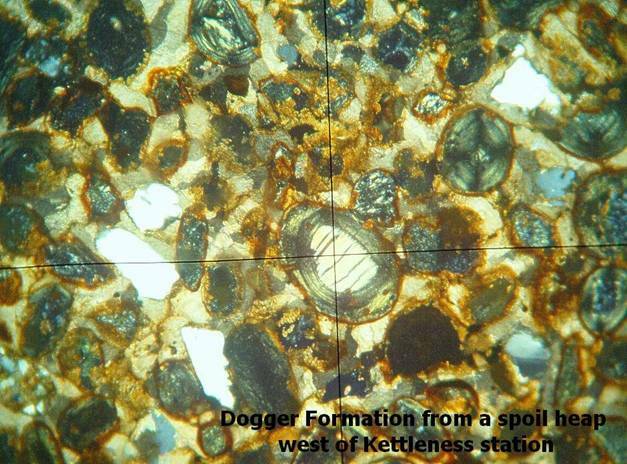 This sample of the Dogger Formation was collected from a spoil heap associated with the Kettleness Mine (NZ820152). It consists of ooids (goethite?) and quartz set in a siderite matrix. Ooids average 1.5mm diameter. The variability of the Dogger Formation is well documented, in places consisting of quartz “suspended” in a siderite marix (e.g. Whitby), ooids and quartz (Kettleness), bioclastic ooidal phosphatic “ironstone” (Cold Moor-~NZ553010), bioclastic ironstone (Warsett Hill NZ692214), black “Murchisonae” shale (Loftus Alum Quarry NZ742200.